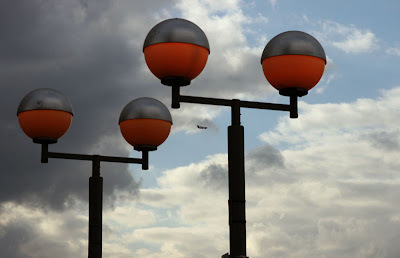 These orbs are part of a slalom track for planes. Air force pilots need to become good at this before they can apply for a space shuttle licence. I guess to make sure they don't hit any planets or moons when floating around in space. Ok so I need to get out more. My cold has gone so I will get back on the streets with my fresh eyes. Don't forget to visit skywatchers around the globe. Fantastic photo, Mo. Pity you came to York when I was away. We could have met for a coffee. Pls promise you will let me know next time you come here. Have a nice weekend. Ciao. A.
I like the tiny little plane in the distance! what an interesting photo! i enjoy the colors of these orbs. Hahaha, I like your comment on this real special photo. I remember visiting London in the 90´s. I stayed in a cheap hostel and they showed a Woody Allen movie from TV to a full crowd that was packed in TV room. It was a "sci-fi"-movie where people had strange vibrations from a big ball called Orb. Everybody laughed like there was no tomorrow. I just remembered this after seeing this and reading the story. Thanks! Nice shot! And nice story too. Ever considered writing a sci-fi novel? I love your shots and I try to look at it nearly every day. Thanks foryour comment on my blog. After it I installed a translater function. so now you can understand my pic´s and text. Fantastic photo and interesting thoughts about the pilots. haha... Anyway it is a well composed photo. Witty post, and interesting picture. I almost missed the plane in the distance. Glad to hear you're feeling better, and I can't wait to see the new pictures! Silly me - I thought they played pool! Oh, I love a good orb and those are mighty fine ones. Happy to hear you're feeling better, Mo. Looking forward your next shots, have a great weekend. I'm not quite sure what to say! Interesting! That is a modern beauty. Great composition. How clever of you...they do make a great SWF shot! Enjoy London! What a great shot! Very creativ! So lucky (?) to catch the plane in the middle of those fun streetlamps! And I had a laugh reading too!